The topic of today’s Thursday’s Truth series involves not so much the general myths of infertility and adoption, but my preconceived thoughts about the type of mother I was going be. Then, I had kids and that little inconvenient thing called “reality” kicked in. You see, prior to kids, I had all these dreams as to how I certainly would or would not do things based on watching other moms. It drove me crazy to be at the grocery store at 9 p.m. and see babies crying, kids trying to climb out of the carts, grabbing things off the shelves, moms uttering an exasperated “What?” to their child repeatedly saying “Mommy!”, and oh yeah, seeing the carts with chicken nuggets and hot dogs in them (Why would you ever feed your child that crap?)! Certainly, my children would be in bed by 9, not out running errands. I would keep my kids happily entertained as I shopped (and definitely not by bribing them!). I was so eager to hear any child call me Mama that surely it would never get old. And, nope, no processed foods! I would be making all of my own baby food, organic of course. To the strict bedtime crowd, I was there with you once. But, that might have been me last week that you were judging for having their children at the grocery store at 9 p.m. You see, dinner ran later than expected and I still needed to get to the store. Tackling the store with two kids in tow requires military precision to keep only what I want in the cart while simultaneously checking my list, keeping either child from melting down and both children in the cart or by my side. My dearest hubby was going to be on hand to help, so to the store we went on our way home. Most days, I do the best I can to keep them on a regular schedule. To those irritated by the screaming child in the store, I was there with you once. But, last summer, that might have been me that you were judging with the screaming child. You see, our daughter had colic and cried 16 hours a day, 7 days a week, long past the usual first three months. Errands simply could not wait for her to settle down. Trust me from experience no one in the store wants that child to stop screaming more than her mother. I did the best I could not to make your shopping trip too painful. To the woman angered at the exasperated mother, sharply answering “What? !” to the little boy repeatedly saying “Mommy!” I was there with you once. But, that might have been me this week you were judging. You see, some days you really can only hear that word so many times. Our son is 3 ½ and will ask the same question 15 times per hour with the necessary question “Why?” following each response I give him. By evening, there are days I want to change my name. I swore that it would never bother me, but sometimes, I can only explain something so many times. I do the best I can to be patient with him. To the health food fanatics, I was there with you once. But, it might have been me this week with hot dogs in my cart that you were judging. You see, sometimes we moms are bestowed with astoundingly picky eaters. Our son is 3 ½ and needs either 24 months or 2T athletic shorts because he is too skinny to wear the appropriate size of 3T. If we serve him new food with no alternative, he will simply choose not to eat. At some point, it becomes more concerning to get some calories in than the quality of food. I compromise. Chicken nuggets and hot dogs have become a way of getting some protein. And, baby food pouches – yup, I still give them to him. Some days that’s the only way I can slip veggies in. I am working on it and he is slowly expanding his palate. Hot dogs and chicken nuggets are only resorted to a day a week or so. Some day, I will get back to the organic, whole food menu for my kids, but for now I am doing the best I can. For those of you who have not been privileged with children yet, write down every time you pass judgment on a mother. Make yourself a checklist of all those things you certainly will never do. That way you can laugh as you mark them off one at a time, violating your own terms of motherhood. Better yet, drop the judgments. I know that is hard as you desperately yearn to be a mom, building your dreams of how it will look. Now days, I am ashamed at the amount of critiques I had. I am pretty sure God purposely provided me challenging children that would motivate me to never pass another judgement again. Nowadays, there is a higher likelihood of empathy washing over me as I watch a mom struggle than a conclusion that I would certainly never do “that”. Believe me, it may not look pretty to an outsider, but most of us moms are doing the best we can at any given moment. We would love to respond to every situation in a storybook fashion, but that nasty thing call “real life” gets in the way. 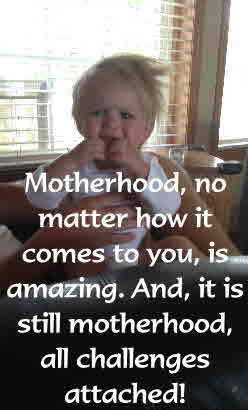 No matter how motherhood comes to you, it is amazing, but nonetheless, it is still motherhood, all challenges attached.